Boosted by international success and investment in innovation, Synectics, a part of Quadnetics Group plc, has announced a 22% increase in revenue for the year ended 30 November 2011, compared with the previous 12 month period. The security solutions specialist recorded revenue of £37.6 million, a major factor in the impressive revenue growth of 13% announced by Quadnetics – helping the Group achieve overall sales of £69.1 million in 2011. Nigel Poultney, Finance Director of Quadnetics Group plc, commented: “Quadnetics achieved solid growth in 2011 and has continued to build on that success, supported significantly by Synectics’ improved performance. Investment of £1.8 million in research and development, via its dedicated Technology Centre, has seen Synectics expand its suite of software-based intellectual property – enabling growth in key markets and success with major international contracts. Cate Brisbane, Quadnetics Group Marketing Manager, said: “Synectics has traditionally performed well internationally but a focused approach to developing surveillance systems that meet specific sector needs has really strengthened this position. Synectic Systems Group (Synectics) is a wholly owned subsidiary of UK-based Quadnetics Group Plc. Synectics is a leading developer and manufacturer of innovative and integrated security systems with 25 years’ experience providing surveillance systems throughout Europe, North America and the Middle East. 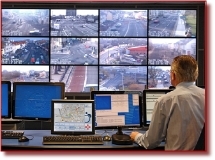 Delivering protection for National, Civil and Commercial critical infrastructure, Synectics is the system of choice for the world's most demanding security environments.